When the Sega Genesis arrived on the video game scene, competition wasn’t exactly booming. The Nintendo Entertainment System had its feet on the ground and Sega Genesis, while having great graphics and potential, needed something to trump Nintendo’s lovable kingdom-saving plumber, Mario. Enter Sonic, a cool blue hedgehog with an attitude to match his super-fast feet. When Sonic the Hedgehog appeared, an epic battle that lasted for years began, pitting the plumber and the hedgehog against each other. How does Sonic fare all of these years later, though? Sonic has a long road ahead of him. Not only has an evil scientist, Dr. Ivo Robotnik (yes, before he was ‘Eggman’), captured his woodland friends in mean-spirited robots, but he is seeking out the seven Chaos Emeralds to take over the world. Of course, our hero being the cool protector of the forest that he is, has taken it upon himself to save his friends and stop Dr. Robotnik from taking over the world. Not as twisted as the original Mario Bros. plot, but just as imaginative. No amount of rings will ease the anxiety that these underwater levels will give you. and jump through the game, just like a certain plumber. Sonic has some power-ups of his own, though, including shields and star-surrounding invincibility. Collecting golden rings, Sonic can gain a life with 100 or access a bonus stage with 50 at the end of the level, which will let him attempt to get a Chaos Emerald. I say ‘attempt’ because, truthfully, I only ended the game with four of them. Those bonus levels are no joke. By holding onto rings, though, you allow yourself to be hit without dying, which can prove to be very useful considering the many dangers of the six zones you’ll travel through. Playing through the game again, Sonic appears to have left a better imprint on my childhood playing memories than it did this time. The game is a solid platformer. The controls are pretty tight, the game is genuinely fun, but I ran into a few problems. While there’s not much going on plot-wise in the game, Sonic is a fun guy. He’s got some loop-de-loops and fun twists and turns throughout his levels, and there’s always something new coming at you. The difficulty also tends to keep pretty steady. It’s never so hard that you get daunted, but it’s not too easy to be proud of beating either. A ball in a ring in a loop. It’s almost profound. run and duck in the middle of it, you can spin through certain walls and enemies. Mind you, if you have played the other games in the series, you know how irritating this is due to necessary upgrades in mechanics. If you’re new to it, though, it’s a fun little trick. Also, by pressing up or ducking, you can get a view of things above or below you respectively. This comes in handy sometimes when you need to see what you’re zooming toward. Of course, by the time you figure it out, you’re probably getting squashed or burnt. Thus, we enter my issue with the game. 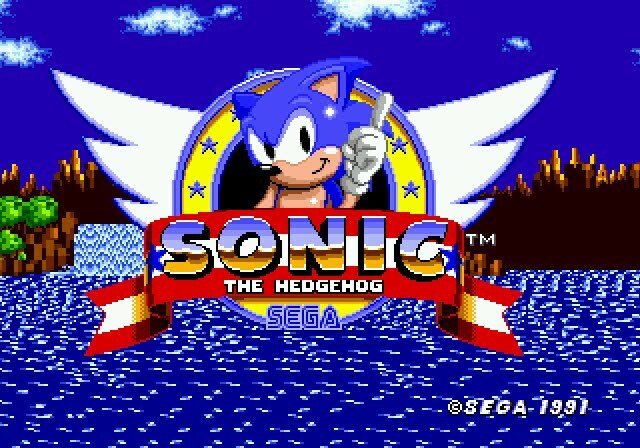 Sonic would have you believe that you’ll be zooming around, faster than lightning, and the game delivers that at moments. This game showed to be more of a test of patience than any other game I can remember. For all of the moments I got to fly through a twisted tunnel or crash through a wall with my balled up self, I spent twice as long standing and waiting for something to happen. Be it waiting for a platform, the right time to jump, or slowly dragging through water, I didn’t feel terribly speedy. Even in the bonus stages, it took a lot of patience to trek toward the Chaos Emeralds within. As a regular platformer, I expect that, but for ‘the fastest thing alive’, I was a little disappointed. That, my friends, is really my only complaint about the game. There are no real cheap parts, nor are there glitches to throw you off. It’s as straightforward as you can get and well pieced together. It’s really strong as far as a pilot game for the Sega. (I don’t count Altered Beast, which my good buddy, Shoggoth, already got to). It’s also a short game, ringing in at about two to three hours, if even that. I wasn’t very good at the game, and I’ll admit that freely. My main issue in these terms is that once you get game over with no continues, you have to start from the beginning again. That’s a personal pet peeve, so if you have this issue, you’ve been warned. Dr. Robotnik’s vehicular boss battles are pretty awesome throughout the game. Usually, I’ll start the front end review with the graphics, but I have to say that I have always and will always love the music in Sonic games. It’s always fun, well composed, and fitting from zone to zone. The theme song is pretty recognizable to just about anyone whose had any experience with Genesis, and I highly recommend the theme to ‘Star Light Zone’ as a personal favorite. The sound effects are tight, too, and thoroughly add to the feel of the game and the ‘speed’ aspect of it. be crisp and colorful with the graphics, and it shows. The scenery is fun and lighthearted, even in darker stages, and the characters and enemies are interesting to look at and artistically just neat to look at. I was actually surprised by some of the graphics and how good they were. My memory must have diluted them over the years. Again I’ll say, this game is a really well packaged game. Despite all of the praise I have for the game, this game does not stand up to the test of time, at least compared to the rest of the series. It’s a lot of fun, but the sequels really improve on a few of the minor flaws of the original, and I found myself trying to do things that I couldn’t do because of that fact, moreso than with other games like the Mario series. If you haven’t played the other games, you’ll enjoy this game, but if you have, going back is kind of a tough trip, even if it invokes a lot of pleasant memories. Just remember either way, you don’t have to rush into everything. In fact, you may find yourself frustrated by doing so. Such is life, and such is Sonic. I always found with Sonic that I got bored after 3-4 levels. It was the speed that set Sonic apart, and the level design as you go on removed the speed for fairly bland platforming. It does feel like you get more stationary as the game goes on, doesn’t it? I specifically think of certain parts, even in the second zone (Marble Zone, I think?) where you’re sitting and waiting for switches and things to move out of the way to move on. I mean, it can’t be all speed all the time. That’s a trap that at least one or two of the Sonic Advance games fell into. I agree that it turns into more of a standard platformer as the game progresses.